I had always been interested in using a body oil as my skin is fairly dry but I was also a bit unsure whether it would be nice to use or if it would be too heavy and thick on my skin. Fortunately I was given the chance to try one from Be Genki and I am pleasantly surprised at how enjoyable it is to use. The Tranquility Body Oil has been formulated to use before going to sleep and helps you to unwind and have restful slumber. Be Genki also has 3 other blends; vitality, serenity and sensuality. What I really like about this body oil is that it is light-weight and doesn’t just sit on my skin or give a greasy feel. It is readily aborbed and has a great moisturising effect. The key ingredients which make this oil so nourishing for the skin are sweet almond oil, jojoba oil and rosehip oil. I also like to use it on my elbows and other dry areas and have noticed a vast improvement in the suppleness of the skin. When it comes to functionality Be Genki’s body oil gets another thumbs up because the dispense method is a great little pump which gives out a really good and manageable amount each time. I much prefer this than having to pour out an oil as that can usually lead to waste and spillage. Be Genki’s bottle makes it easy to use and involves no mess! And of course I also like this product because it doesn’t contain any hidden nasties such as petrochemicals, mineral oils or artificial fragrances. Please note though that they do not recommend to use this whilst pregnant. Be Genki is an Australian owned company started by Sam Sample and she is an advocate for holistic health and wellbeing and is regularly interviewed by the media for her advice. Genki actually means happy in japanese and I just love the positive attitude and daily reminder that every time I have my after shower ritual I can remember to Be Happy! Sweet almond oil, Jojoba seed oil, Rosehip oil, sweet orange oil, lavender oil, roman chamomile oil, east indian sandalwood oil. This product was given for review consideration by Be Genki. All product reviews and honest opinions on this site are solely that of my own and I am not endorsed or paid for this review. 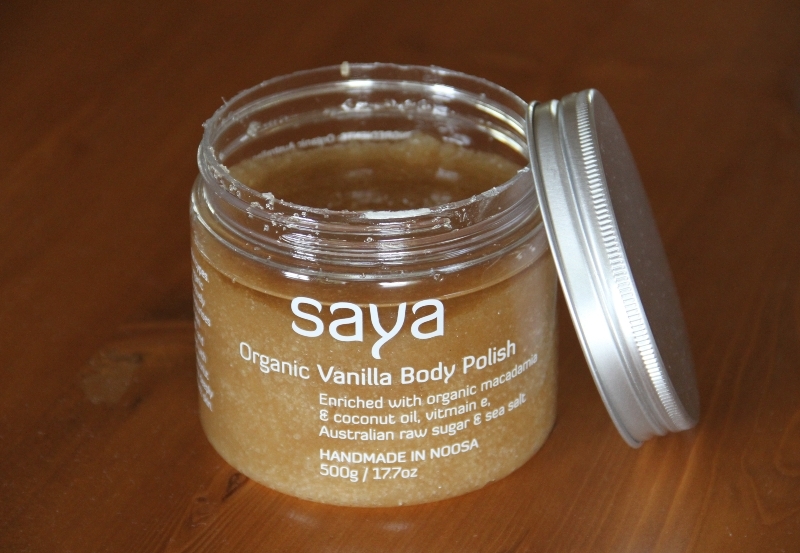 If you are looking for a great gift or just want to spoil yourself then this Organic Vanilla Body Polish by Saya is a fantastic choice. This product not is only a great exfoliant but because of the natural oils it will also leave your skin moisturised and nourished after and you will not need to moisturise with anything else after your shower. 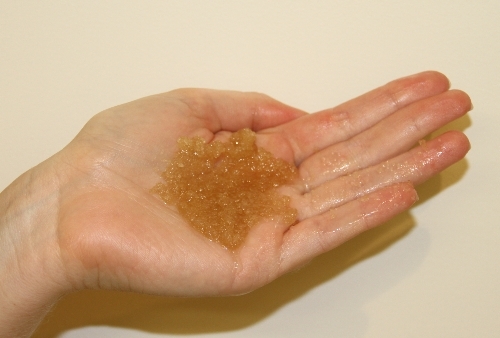 The exfoliant part of it comes from the organic raw sugar and sea salt. The crystals are fairly big which feels great against the skin and it also has a kind of massaging effect. The natural oils used include coconut oil and macadamia oil which have great healthy nourishing properties. After you rinse off just try pat dry your skin with a towel so you don’t wipe away all the lovely oils. This is my favourite thing about this product as I don’t have to do anything else to moisturise my skin after showering! The one I have used is the Vanilla and the smell is just divine. It also comes in a Frangipani option too. I really enjoy the packaging and presentation of Saya’s products, especially this one as it has a nice earthy feel to it and looks great in the bathroom. Some tips for when using this product include; standing away from the shower stream when using so it doesn’t wash away too quickly, wipe away any residue in the shower because it might attract ants (or maybe it is just the area I live in), and be careful not to slip on the oil in the shower/bath. I recommend using this 1-2 times per week or whenever you need to spoil yourself. Organic Australian raw sugar, Australian sea salt, cold pressed organic coconut oil, cold pressed organic macadamia oil, natural vitamine e (non gm), natural mica mineral, fragrant oil. This product was given for review consideration by Saya. All product reviews and honest opinions on this site are solely that of my own and I am not endorsed or paid for this review. Can we be doing more damage to our skin and bodies using sunscreen versus not?? Well, if you are still using the traditional sunscreens available that are full of parabens, petrochemicals, sulphates and other toxic ingredients, then the answer might be yes. The effects of the the toxins on your skin can be just as harmful if not more than exposure to the sun without sunscreen. Thankfully there are better choices now available to help keep you and your family’s skin safe. 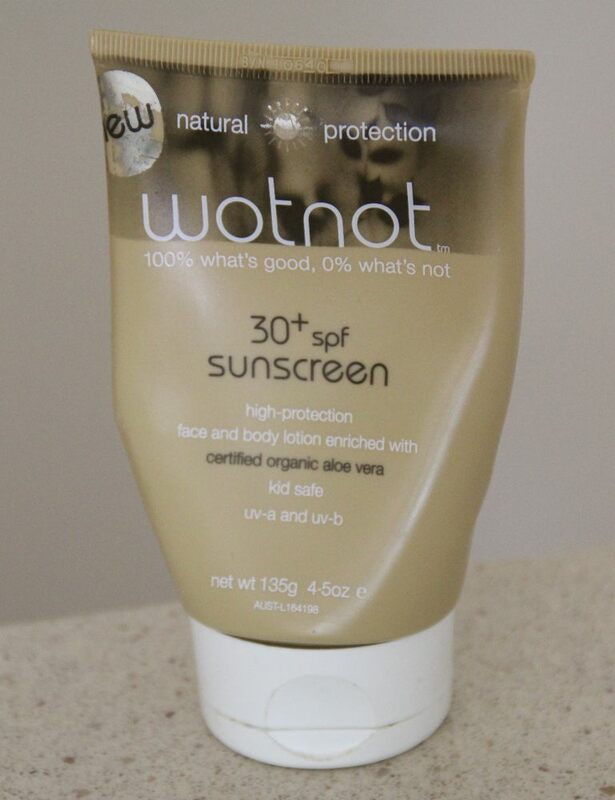 Wotnot’s 30+ spf sunscreen is a great example of a natural high protection sunscreen that is also enriched with aloe vera and vitamin e to nourish the skin. The formula is a little thick and greasy but it still goes nicely on the skin. It has definitely stopped me from burning numerous times and I feel a lot better putting this on then the regular toxic versions. It also has a slightly strangle smell that reminds me of playdoh but it doesn’t last for long. Perhaps they could look to add a natural fragrance to help? We hopefully all now know how potentially dangerous standard chemical based anti-perspirants and deodorants are. With the armpit directly leading into our lymphatics nodes and lymphatic system, applying harmful chemicals to that area can lead to numerous problems. The breast cancer councils are now advocating more natural solutions and warn against the risk of using deodorants that stop perspiration as these can actually block the sweat glands and ducts leading to a build up of toxins. Thankfully, after much searching, I have found a natural deodorant that smells nice and works! 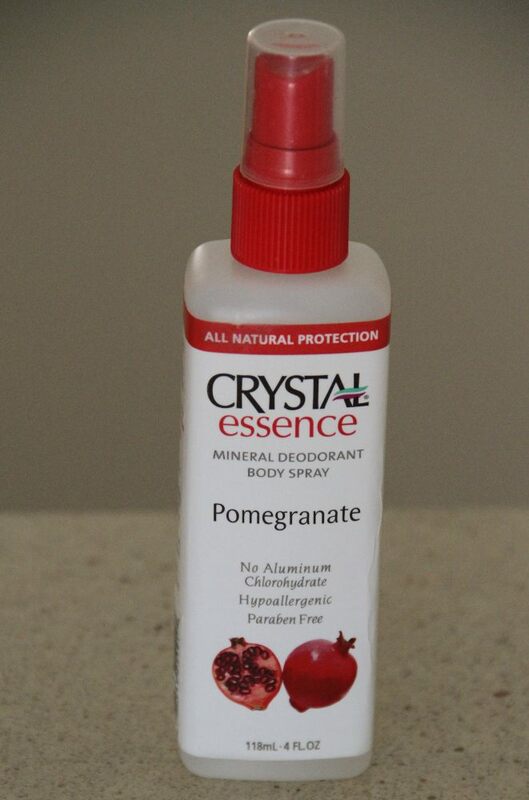 Crystal Essence have a range of natural deodorants on the market but the Pomgranate Body Spray is by far my favourite. Unlike roll-on deodorants, this one isn’t sticky and doesn’t leave my armpits sticky and wet after use, therefore making it more clothing friendly. The smell is refreshing and not overly bearing or not too floral which makes it ideal for everyday wear. The natural mineral salts help provide a natural protective barrier against odour-causing bacteria. If you haven’t found a good natural deodorant that you like yet, I would definitely recommend that you try this one. Purified water, Natural mineral salts (Potassium Alum), natural fragrance made with pomegranate essential oils and extracts. For the summer time I prefer a light and “easy to apply” body moisturiser that is not too heavy, especially because I live in a humid climate in the summer. 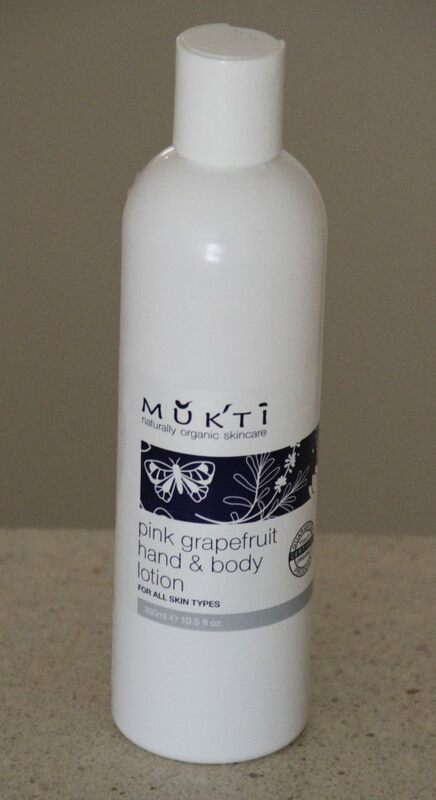 The Mukti Pink Grapefruit Hand & Body Lotion is a great option that is fresh and light on the skin. My favourite thing about this moisturiser would have to be the scent. It is subtle but the citrus scent makes it really fresh and not overwhelming, perfect for summer. It is also a lotion so it is not thick like a cream so I also find it goes on easier and goes further. My only one dislike with this product is that it doesn’t absorb into the skin straight away and I need to rub it in again after it dries a little. Mukti is a Queensland based company. I just love supporting local businesses and making my skin feel and look good too! This product can be purchased for a great price of $35 for the 300ml bottle online at www.muktibotanicals.com.au. Certified Organic Aloe Vera (Aloe Barbadensis) Leaf Juice; Certified Organic Macadamia (Macadamia Ternifolia) Oil; Certified Organic Shea Butter (Butyrospermum Parkii); Certified Organic Coconut (Cocos Nucifera) Oil; Cetearyl Glucoside (Vegetarian); Certified Organic Cocoa Butter (Theobromo Cacao); Glycerin (Vegetarian);Sclerotium Gum; Grapefruit Seed (Citrus Grandis) Extract; Certified Organic Essential Oils of Orange (Citrus Sinensis), Mandarin (Citrus Nobilis), Tangerine (Citrus Tangerine), Lavender (Lavandula Angustifolia).